the nytpicker: Why Won't Joe Nocera Tell The Truth About Steve Jobs? Maybe Because He's A Hypocrite. 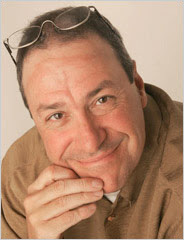 Why Won't Joe Nocera Tell The Truth About Steve Jobs? Maybe Because He's A Hypocrite. On his ""Executive Suite" blog this morning, Times business columnist Joe Nocera strongly suggests that Apple CEO Steve Jobs is lying about his health. What's the basis for Nocera's claim? It's an off-the-record conversation with Jobs from last summer that Nocera still refuses to discuss, except that he can't seem to stop mentioning it every chance he gets. "I said at the time that I knew I was being spun by Mr. Jobs," Nocera writes. "But I didn’t think I was being lied to. Now, I’m not sure what to think." But of course he does, if he told us the truth last summer. Supposedly, after getting the reporter to agree to go off-the-record, Jobs came clean and confessed the precise nature of his illness. But now that Jobs has removed himself from the Apple leadership with new disclosures about his health, Nocera has jumped on the opportunity to label Jobs a liar. "It is possible...that [Jobs] and Apple are telling the truth," Nocera writes in today's blog post. "Possible — but unlikely." Why is Nocera still holding back what he knows about Job's health? Maybe he's calculating that if continues to keep Jobs's confidence, the CEO will reward him with another off-the-record phone call. Whatever the reason, it's hypocrisy. It all began last July, when Jobs called Nocera to deny that he'd had a recurrence of his pancreatic cancer. That call followed several conversations between Nocera and Apple public relations officials, who kept telling the Times that Jobs's health was a "private matter." Nocera and Times reporter John Markoff had been following up on rumors that Jobs's weight loss was the result of a cancer recurrence. The now-famous conversation with Jobs began with the Apple CEO calling Nocera a "slime bucket" for getting his facts wrong. He then got Nocera to agree to an off-the-record conversation, in which he told the reporter the true nature of his illness. In the blistering column that followed a few days later, Nocera accused Apple of operating in a culture of shadowy behavior. "Apple simply can’t be trusted to tell truth about its chief executive," Nocera wrote, referencing the company's addiction to secrecy in product development. But then -- as now -- it was Nocera who was operating in a deceptive manner, by agreeing to talk with Jobs off the record and keeping that information secret despite his own insistence that the public has a right to know. "Off the record" is a term to describe a process by which journalists gather information without attribution to a named source. It isn't meant to give reporters a special privilege to gather private information not passed on to readers. In other words: when Joe Nocera got on the phone with Steve Jobs last summer, he did so as a representative of the New York Times, not as a private citizen. He had a responsibility to his readers, and to his employer, not to accept information he wasn't allowed to repeat, or at least attempt to confirm with other sources. If, in fact, the conversation was truly off the record, what Nocera should have done was to not blare the fact of it to millions -- without revealing the substance of it -- but instead to take the information and see if he could confirm it elsewhere. By any journalistic standard, that would have been a legitimate use of the information; after all, Jobs knew he was talking to a reporter. But instead -- for reasons that suggest Nocera's egotism in wanting to show the world that Steve Jobs had called him -- he reported everything about the call except the words themselves. It's doubtful that's what Jobs had in mind. Because the conversation was off the record, I cannot disclose what Mr. Jobs told me. Suffice it to say that I didn’t hear anything that contradicted the reporting that John Markoff and I did this week. While his health problems amounted to a good deal more than “a common bug,” they weren’t life-threatening and he doesn’t have a recurrence of cancer. After he hung up the phone, it occurred to me that I had just been handed, by Mr. Jobs himself, the very information he was refusing to share with the shareholders who have entrusted him with their money. You would think he’d want them to know before me. But apparently not. Now Nocera wants to have it both ways. He takes pleasure in ripping Jobs apart for his failure to disclose crucial information to shareholders, while insisting it's his own responsibility to maintain his off-the-record pledge. There are certain people who simply don’t have the same privacy rights as others, whether they like it or not. Presidents. Celebrities. Sports figures. And, at least in terms of his health, Steve Jobs. His health has become a material fact for Apple shareholders. His vagueness about his health, his dissembling, his constantly changing story line — it is simply not an appropriate way to act when you are the most important person at one of the most high-profile companies in America. On the contrary: it is infuriating. What's truly infuriating is how Nocera sees himself in a special category of Times reporter -- one who is entitled to have off-the-record conversations with prominent Americans and then keep their secrets. It's as though Nocera somehow thinks Jobs shared his secret with him because of who he is, and not because of the newspaper he represents. Of course he's wrong. "'Off the record' is a term to describe a process by which journalists gather information without attribution to a named source. It isn't meant to give reporters a special privilege to gather private information not passed on to readers." That's exactly what off the record is: a process by which journalists gather information that they can't use (unless they get it from another source) They can't use it because it literally is to be kept off any records of the interview. What you're thinking of is called "not for attribution" or anonymous sourcing. The distinction is made in basic journalism textbooks. This post, for example, is ON the record, but anonymous. For one thing, we don't own any "basic journalism textbooks," and we don't know anyone who does. Good journalism schools don't use textbooks, and good journalists don't use them as the basis for anything they do. If all journalists were forced to follow a single set of arbitrary rules as presented in a book, most of modern journalism wouldn't exist -- including the work of Bob Woodward, Truman Capote, Gay Talese, Tom Wolfe, etc. That said, there's no contradiction between what we said, and what you believe. "Off the record" is a means for a reporter to gather information without identifying the source of that information. When Bob Woodward gets off the record information from one source and confirms it with another off the record source, that information can then be used. None of his reporting is attributed to any sources. The point we're making is that it's improper for a reporter to treat "off the record" information as private. When a source speaks to a reporter and reveals information, he knows that he is giving that information to a reporter, not to a private individual; that means the reporter can repeat that information. When Steve Jobs reveals facts he knows first-hand to Joe Nocera on an off-the-record basis, it isn't appropriate for Nocera to keep the information to himself. Jobs told Nocera about his illness, and Nocera should have attempted to get that information into print, without citing the off-the-record conversation. Instead, Nocera did the opposite: he told everyone that he'd had an off-the-record conversation -- what do the journalism textbooks say about that? -- and then wouldn't disclose what he said. Nor did he attempt to confirm it, or publish the information. That is not how a good journalist should operate -- no matter what the rule books might say.